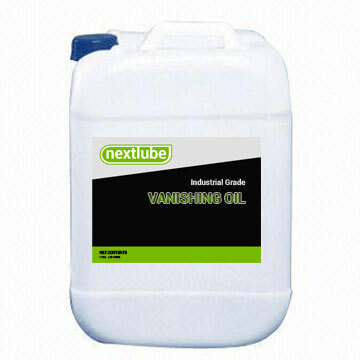 VANISHING OIL is a combination of low viscosity synthetic and light petroleum oils mixed further with stabilizers and friction reducing agents designed for metalworking operations involving stamping, slotting, drawing and punching of round, square, rectangular or irregular shape or forms of holes on thin sheets of aluminum, copper or stainless sheets in an automatic or conveyorized mode. VANISHING OIL provides the necessary lubrication on the cutting oil so that the holes will be free of burr and sharp edges. Metal tearing and course surface on drawn metal bends can be avoided also. Both are non-staining to ferrous and non-ferrous metals. is a combination of low viscosity synthetic and light petroleum oils mixed further with stabilizers and friction reducing agents designed for metalworking operations involving stamping, slotting, drawing and punching of round, square, rectangular or irregular shape or forms of holes on thin sheets of aluminum, copper or stainless sheets in an automatic or conveyorized mode. Both are non-staining to ferrous and non-ferrous metals.